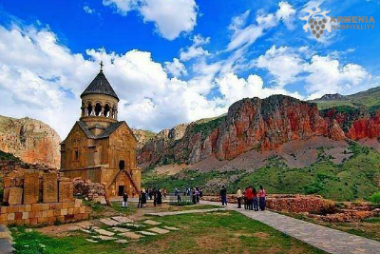 Notes: During this tour you will see the popular tourism attractions of Armenia in a short period of your stay. Tours are conducted in comfortable cars and buses with a guide. The tour can be included lunch, tasting tour of the world famous Armenian brandy, museums, farewell dinner in the national traditional Armenian restaurant with “live” music and of course with the most delicious and environmentally friendly food. A gift from the company! Visiting the museum carpet “Megerian” – Armenian carpet weaving has century carpets only on a natural basis. Master class and a photo shoot. Day 1: Thursday. Arrival, transfer to the hotel. This day we will start with a trip to Garni. 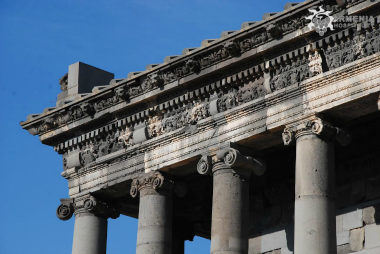 Garni Temple is a vivid example of Hellenistic culture on the territory of Armenia. Here the ruins of a bath (3rd cent) and a palace (2nd cent. B.C.) can be seen. Garni is located on a deep canion of Azat river, and from here one can enjoy a panoramic view over the river gorge. Proceed to the cave monastery of Geghard. The spear with which the roman soldier killed Jesus Christ, was kept here and hence the name of the monastery was taken. (Geghard means Holy Spear). This prominent work of architecture, partially carved in the rock, is listed in the UNESCO world heritage list. Optional: Lunch with cooking Armenian bread lavsh in tonir. Next departure on Lake Sevan. Sevan-alpine lake in Armenia (situated at an altitude 1900m. ), The largest in the Caucasus. Visiting the monastery of Sevan peninsula, with a height which overlooks the beautiful views of the sparkling emerald Sevan. Day 3: Saturday. 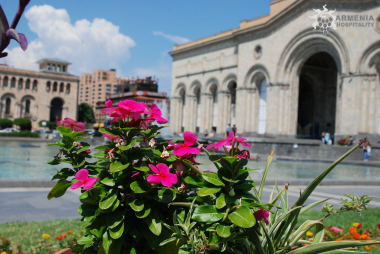 Yerevan – Echmiadzin – Zvartnots – Yerevan. Breakfast at the hotel. Meeting with the guide. Tsitsernakaberd – a museum and memorial dedicated to the Armenian Genocide in the Ottoman Empire in 1915. Yerevan is one of the oldest cities in the world 782 BC, extant. Yerevan today – a modern metropolis, political and cultural center of Armenia. It attracts more and more tourists for its architecture, hospitality, cozy cafes and restaurants and streets. Undoubtedly majestic Ararat – the biblical Mount leaves a lasting impression and visible from almost all corners of the city. Departure to Echmiadzin. Echmiadzin is the ancient capital of Armenia. According to legend, Jesus Christ came down from heaven and have a place to build a church. Cathedral of Holy Etchmiadzin was built on this site in the 4th century (301-303), at the dawn of the Christian conversion of the country. The cathedral was built over the pagan temple of Vagharshapat, after the king Trdates destroy it. Armenia was the first country in the world to adopt Christianity as a state religion. Echmiadzin is the residence of the Supreme Catholicos of all Armenians and the center of the Armenian Apostolic Church. Visiting Zvartnots temple. An architectural masterpiece “Zvartnots” was built in the period from 641 to 662 years. It was destroyed by an earthquake in the 10th century, it was discovered nearly a thousand years later, in 1900-1907gg . In 2000. excavations included in the UNESCO World Heritage List. Vernissaj opening Day (only on Saturdays and Sundays) – craft fair in the open. Here you will find souvenirs, paintings of Armenian artists, folk instruments, carpets, rugs, handmade jewelry and other things that you can buy as a souvenir. Our GUM market – where you can buy delicious Armenian national sweets, dried fruits, and the most delicious seasonal fruits and vegetables! Return to the hotel. After the breakfast visiting Khor Virap. Khor Virap – Armenian Apostolic Church monastery near the border with Turkey, at the foot of Mount Ararat. The monastery is known for its location, it is with its location offers one of the most beautiful views of the biblical Mount Ararat, where, according to legend, appeared on Noah’s Ark after the Flood. The monastery is situated on the underground prison in which the Armenian king Tiridates III kept in captivity for about 15 years, St. Gregory the Illuminator, before it was converted to Christianity (in 301 AD). Entrance to the underground prison, survives to this day, is located in the chapel of St. Gregory, built in 1661. Driving to the monastery of Noravank. Noravank – a monastery complex, built in the XIII century. Noravank was founded in 1205. The monastery complex includes the Church of St. Karapet (Saint John), the chapel of St. Gregory (St. Gregory) with vaulted hall and church Astvatsatsin (Holy Virgin). Noravank was also the residence of the Armenian princes Orbelian. At the end of XIII – beginning of XIV centuries worked here Siranes architect and a prominent sculptor and miniaturist Momik. The fortress monastery walls were built in the XVII-XVIII centuries. A visit to the winery “Areni” (wine tasting). The return to the hotel. Day 5: Monday. Transfer to the airport for flight home. Price for 1 person (in USD) in a double room. All prices require verification based on the currency exchange rate of number of people and the season of arrival at time of booking. COME, SEE, FEEL, DISCOVER… ARMENIA HOSPITALITY!! !